American Ebola, vaccine trials: Outbreak news. 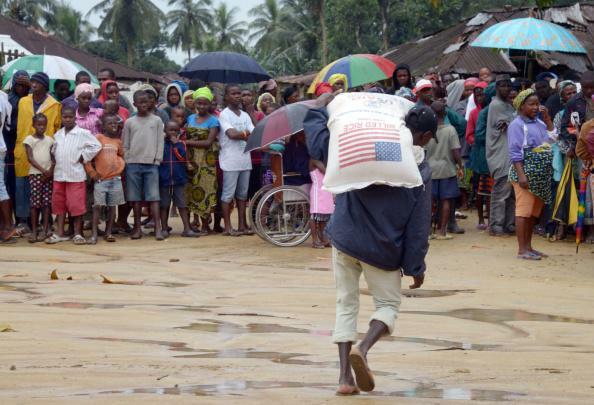 Food delivery in a quarantined town in Liberia. The two Americans who previously contracted the disease were treated in Atlanta with an experimental drug and have been released. Anthony Fauci, director of the National Institute of Allergy and Infectious Diseases, told CNN that the vaccine has tested well in chimpanzees. Human trials may soon be conducted in other countries—but not in Liberia, Sierra Leone, or Guinea, the sites of the current outbreak—because “the existing health care infrastructure wouldn’t support them,” Fauci says. GlaxoSmithKline will begin manufacturing “up to 10,000 doses” of its vaccine in case the World Health Organization decides to authorize emergency immunizations in the affected countries. A second vaccine, developed by the Public Health Agency of Canada, will begin testing this fall.